This chapter looks at the ways in which teacher training and teacher development are taking place online. It seeks to address the ways in which teachers learn to teach and considers how “Web 2.0” applications and other collaborative, interactive technologies may transform teacher education. In an overview of teacher development theories, including social constructivism and critical reflection, the chapter attempts to situate current practices in relation to research in teacher learning. The second part of the chapter focuses on blended and distance learning, Computer Mediated Communication, and the applicability of Web 2.0 applications to teacher development. It is hoped that the chapter will provide a useful summary for teacher trainers and classroom practitioners who are hoping to use technology for developmental purposes. At the same time, it may assist those who are working with technology but are less familiar with the context of how teachers learn. English Language teachers are a disparate and diverse professional group. There are teachers working in tertiary, secondary and primary education, as well as private institutions, across the globe. Teachers may work with students on a one-to-one basis, or teach hundreds at a time. Certain approaches or methodologies are practiced rigidly by some, while others take a more eclectic approach. It is also very important to remember that the vast majority of English teachers are not native speakers of the language. Teachers from different contexts also learn to teach in different ways. Non-native speakers of English, especially those working in state sponsored institutions, usually require nationally recognized qualifications to enter the profession, with formally established developmental pathways. On the other hand, many native speakers come to English Language Teaching with little or no specific teacher training. This chapter will deal with the idea that, whether teachers are “educated” in directed programmes or they “develop” through experience and reflection, all teachers are to some degree responsible for their own growth. The assertion is that all teachers operate in their own “spaces,” both metaphorically and literally, and the issue of how they develop themselves professionally is a pertinent one. As the Internet evolves, the options for both teachers and teacher educators are changing; flexibility across time and space is improving and new paradigms of interaction are beginning to gain credibility. Changes in the role and influence of ICT in teacher development occur very quickly. Technology cannot yet meet the goals of some practitioners, who are glimpsing the possibilities of this new world. As they race ahead, there are far more who are in danger of being left behind. The digitally poor, who do not have the equipment, the knowledge or the confidence to enter the online world fully, may be missing out on developmental opportunities. Normalization, as defined by Bax (2003), is not a uniform process. However, even those who are not familiar with the term “Web 2.0” may well be familiar with some of the applications to which it refers. 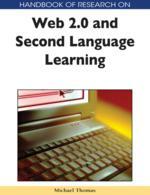 What Web 2.0 is exactly is not so easy to define. O’Reilly’s (2005) comparative list of Web 1.0 and 2.0 applications has been much re-presented, and remains one of the pithiest distillations of the concept. Kelly (2005) was almost evangelical over the development of Web 2.0 as a religious “Beginning,” which concerned Carr (2005) greatly. His criticism of those who sought to assign ethical values to technology is not directly relevant here, although it is worth remembering that computers are merely tools and will never be a panacea for all social or educational problems. Tim Berners-Lee, one of the Internet’s founding fathers, is somewhat cautious about the term, and has complained that it “lacked coherent meaning,” having become a marketing buzzword (quoted in Anderson, 2006). Brown’s insights (2007) into the links between constructivist theories of learning, CMS (Content Management Systems) and Web 2.0 in education seem especially apposite to this study. He drew parallels between the characteristics of Web 2.0 and the learning paradigm (active, multilateral, engaged), as opposed to Web 1.0’s traditional teacher centred style, and cautiously suggested layering higher education CMS’s with appropriate Web 2.0 applications. Despite some misgivings about the term itself, what is undeniable is that millions of people have access to broadband, and that interactive Web applications and platforms are now increasingly part of the mainstream. This chapter approaches the Internet from the perspective of teacher education and defines Web 2.0 as a platform through which tools can be accessed, a shared space for collaboration, and as a repository of knowledge which can be added to, manipulated and re-presented. Teacher Development: Self-initiated or directed activities which enable the teacher to learn more about teaching and / or themselves. Social Constructivism: A learning theory. Each of us is shaped by our experiences and interactions. Each new experience or interaction is taken into our schemata and shapes our perspectives and behaviour. Metacognition: This term is used in cognitive theory to describe the awareness of one’s own thinking or cognitive processes in order to improve self-development. Reflection: The act of critical consideration on experience, in order to grow. Novice / Expert: A teachers experience and confidence leads to expertise. Novice teachers may be skilful, but experience enables teachers to know “what to do.” Expertise is neither a permanent state nor a foregone conclusion. Virtual Learning Environment: A platform which allows educators to deliver material, interact with learners and track progress. Teacher Training: A top-down process in which teachers are equipped to teach. Based on the evaluation of competencies.